Corporate Volunteers from Danone will be at Sufra NW London in the coming week to make Christmas Wreaths for elderly residents of St. Raphael’s Estate. The hand-made gifts will be distributed the week before Christmas to bring some festive cheer to people who live alone. 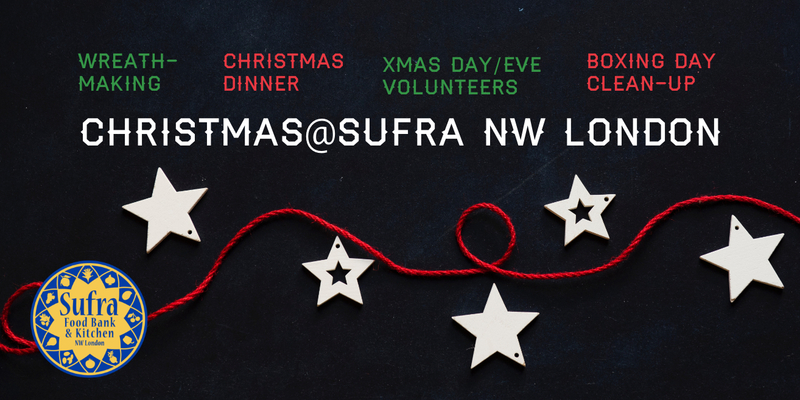 Would you like to refer someone or a family to Sufra NW London for Christmas Dinner? We don’t want anyone to be alone this Christmas. If you know someone or a low-income family that you would like to refer to Sufra NW London, please get in touch with us here. December is the busiest month at Sufra NW London and we need some extra help over the festive season. On Christmas Day we will be serving over 120 dinners to our guests, who would otherwise be alone or unable to afford a traditional meal. We need volunteers on Christmas Eve (for cooking) and Christmas Day (cooking, serving and providing a taxi service for guests reliant on public transport). We also have our annual Winter Clean Up, so if you fancy helping with a deep clean of the building, please sign up. I know it’s not the sexiest volunteering role – but it is essential, and we have a special gift for everyone who helps scrub down the Food Bank shelves. To sign up for Christmas volunteering (Christmas Eve & Day), click here. To help provide a Christmas collection/drop-off service for guests (you need your own car), click here. To receive a special Christmas gift from Sufra NW London (and help with our Winter Clean Up on Wednesday/Thursday 26/27 December), click here.